Few people gathered in Parisian streets and across French cities on Saturday to oppose French President Emamnuel Macron's leadership and policy after the movement has gradually lost steam in recent weeks. The Interior Ministry's data showed 23,800 were participating in country-wide demonstrations by 1300 GMT, down from 33,500 last week. In Paris, about 2,000 people took part in the protest. Wearing the yellow vest, which symbolizes the latest confrontation between Macron and discontent people in the countryside and provincial cities, hundreds marched in the streets of Montmartre near the Sacre Coeur Basilica, one of the country's tourist landmark site. Scores gathered in Versailles, west of Paris, where the Versailles chateau and gardens, one of France's most brilliant sites, remained closed on risks of rioting. In regions,"Yellow Vests" blocked trucks at the borders and access to shopping centers. The fresh day of action was relatively calm with no violent incidents reported. However, by nightfall, police fired tear gas and used water cannon to clear the Champs Elysees avenue where hundreds were gathered. Similar incidents were reported in Bordeaux, Nimes and Toulouse. According to state-run radio France info,109 people were arrested in the French capital, among them Eric Drouet, one of the movement's representatives. The 33-year-old truck driver was put in police custody on charges of "illicit organization of a demonstration on the public highway, carrying a prohibited weapon and participation in a group formed for violence or degradation." The "Yellow Vest" movement, a nation-wide protest against weak economic performance and stagnant income increase under French president, started as a campaign against surge in fuel prices this year. 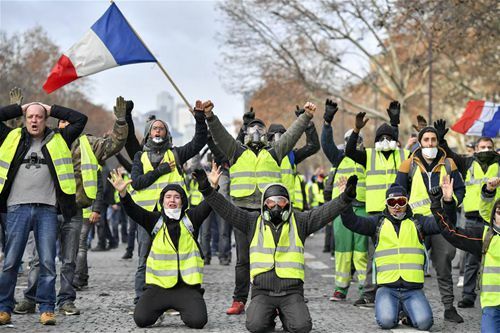 Since Nov.17, thousands of drivers wearing highly visible yellow vests blocked roads across the country and staged streets protests, with some of them turned violent notably in Paris where cars were set on fire, monuments were vandalized and restaurants and boutiques were looted. Ten people were killed in road accidents linked to the protests.